School's out for the summer! This has a new meaning to me being an adult with children. Working from home it means a new challenge in creating activities and keeping little bodies active while managing a website, goods and customers. My buddy Mike is a teacher and the summer has entirely different implications for him, as he gets a break from his job, but also picks up duties watching his son. I meant to post this closer to our ride when the weather was absolutely beautiful here in May, but since summer solstice just passed I figured now is as good a time as any. I have been head down doing my best to grow Chief Cyclery and have been missing out on riding as much as I would like, so when Mike called me for an afternoon bike ride on his last day of teaching for the year I was all in. I suggested we take a more relaxing pace and snap photos; Mike agreed and grabbed his Ritchey Commando Fat Bike and some whiskey for the celebration. 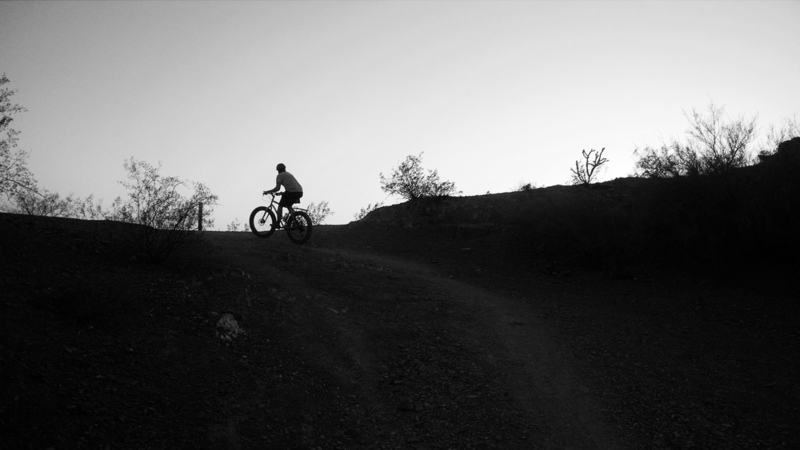 We decided to ride the Phoenix Mountain Preserve since it is close to both of our houses. I picked Mike up in the minivan and we headed over to Dreamy Draw where trail 1a begins. There are so many fun off-shoot trails in the Mountain Preserves that is predominately known for the Charles M. Christiansen Trail 100. Hopefully I can explore more of them here on the blog and build upon my last post of Shredding the Phoenix Mountain Preserve. The trailhead starts with a short abrupt climb to get the legs turning and cruises alongside the freeway with some smooth single track and a natural tree tunnel (hopefully I can get a better picture another time) which is like a majestic waterfall for us here in the desert; before arriving at a man-made tunnel that takes you under the freeway to meet up with Trail 100. 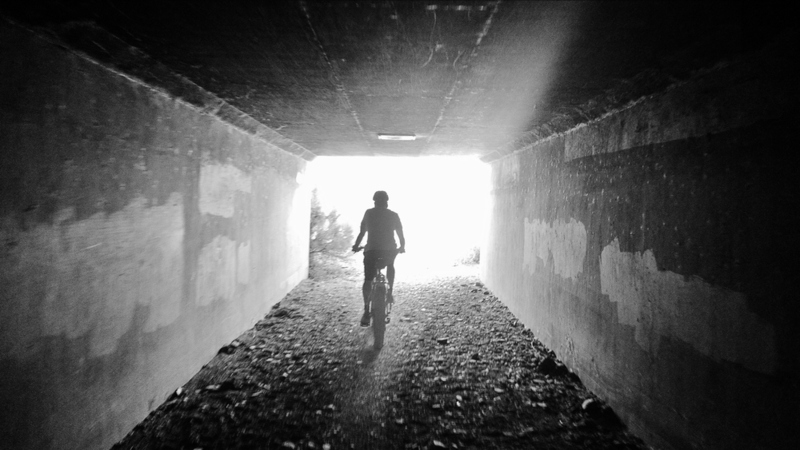 Before the tunnel under the freeway there is a fun drop-in that Mike hit up that leads into a slippery sand pit that was no problem for his 4" tires. We cruised along 1a on the east side of the freeway, which is a like a nice pump track before a short climb and stopping at a beautiful 360 degree lookout. We stopped and chatted about life and summer plans. Mike broke open the Whiskey and we enjoyed the view of the Valley from above. You can see Downtown Phoenix as it continues to grow and all the way to South Mountain which has great riding on it's own. Look north and you can get a view into North Phoenix and the mountains at the base of Cave Creek. After the serene break we were on our way to meet back up with Trail 100 that merges right off the Dreamy Draw Shared multi-use path. As we joined Trail 100 we caught the tail end of another group and picked up the pace for the next mile which saw us climb 250 ft. Mike is such a strong rider, it's always a fun challenge to keep pace with him. The trail was bustling with hikers and riders soaking up the last nice few days of weather before the 120 degree days arrived. From there we did a fun 3 mile loop that took us almost to the very eastern end of trail 100 before circling back to ascend the peak on trail 8. The loop combines smooth gravel with a few dry ravines crossings. I always seem to find peace among the many desert plants: saguaro cactus, agave, and desert flowers. You can really build some speed on the loop and is a nice break from the short steep climbs across the Preserve. Trail 8 is another punchy climb that gets the heart racing. We climbed another 150 ft just as the sun was setting to view full nuke explode in the west as the sun set on the valley. This made for some great pictures and setting a great tone for descending back to the car. The descent after this peak is more technical than I am use to. Mike blasted down it on his fat bike no problem, but I took it slow for my first time wishing for either a quick release clamp or a dropper post. My motto has always been "live to ride another day". Being risk adverse has helped me stay away from getting in over my head most of the time. When I met Mike at the bottom of the descent we debated taking the road back to the car but decided it was just too nice to not take dirt back. We cruised back and loaded up just as the final glimmers of the sun were lost.